Mercedes unveiled their highly anticipated hypercar ahead of the Frankfurt motor show and it's a huge display of how Formula One and the road car industry can blur the lines. 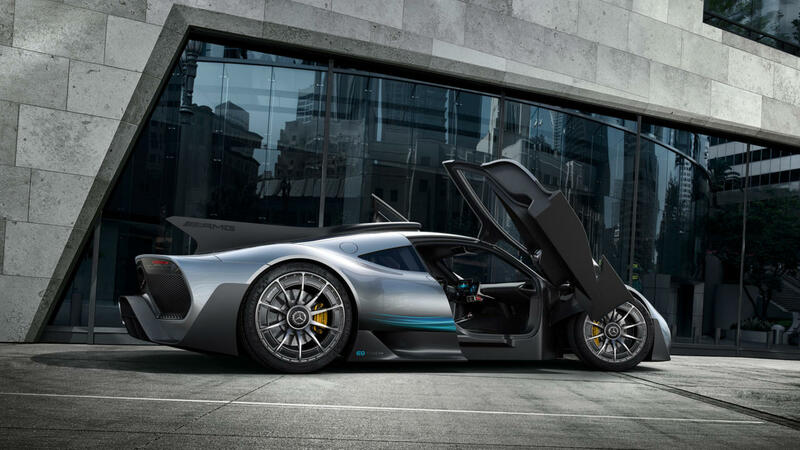 Built around the MercedesAMGF1 powerunit the Project One hypercar will offer the lucky few that can afford it to indulge an assault on the senses that few will ever get. 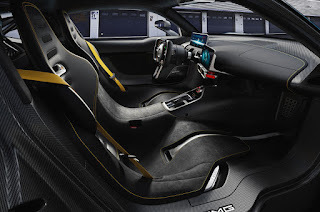 It’s easy to draw comparisons with the original F1 crossover - the McLaren F1, from the gull-wing doors - now stablemate of the genre, to the racer focused cockpit (albeit not the central seating position that the F1 owned) but, the Project:One is unique in its own ways, taking a huge amount of what has been learnt in the sporting arena and transferring it to the road. The car, like many hypercars, is a refined example of the direction engineering led projects are taken, each and every detail put under the microscope and so whilst it isn’t as brash as Pagani or Lamborghini, it isn’t supposed to be. Instead it has hints of other current and classic machines about it, as I’m minded of a Porsche 918, McLaren P1, Ferrari 360 and even a Saleen S7. From a styling perspective the lower bumper intakes bear a resemblance to other AMG models and whilst DRL’s caress the upper outer quarter of these the LED headlights have been split into three above. Clearly form has played a role in the car's overall silhouette but it’s not defined by styling choices, rather seen as a secondary consequence of the car's aerodynamic performance, which is improved further when the car squats in track mode. Rearward facing vents break up the bonnet and dispense with any heat being generated by the electric wizardry beneath them, whilst active aero is present above the wheel arches, as three panels swivel to release pressure built up in the arches as speed builds - which as we know can be problematic at high speeds. The car is flanked by what are becoming customary on hypercars - displaced skirts and are much like we’ve seen used in LMP1 design for some time, managing the airflow along the side of the car. An F1 inspired intake dominates the roofline and delivers a supply of air to the hungry turbocharger below, whilst the F1 inspiration doesn’t end there as a shark fin is connected to the intake improving the car's stability in yaw. Of course an F1 inspired car would be useless without dollops of downforce and the Project:One delivers with a monumental diffuser and retractable rear spoiler. 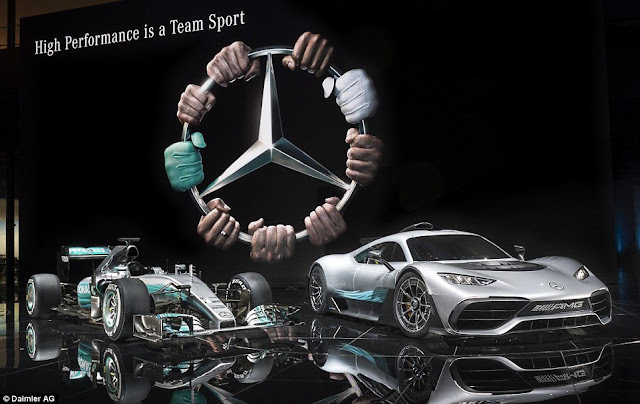 The project’s beating heart is a direct transplant of the powerunit that has helped Mercedes to three back-to-back constructors titles but there’s a twist, as without those pesky FIA regulations the manufacturer has been unshackled, delivering even more toys than even Lewis Hamilton and Valtteri Bottas have on hand. The Formula One department - HPP - High Performance Powertrains, have been pivotal in the development of the powerunit for this project, having already taken the thermal efficiency bar and raised it above the 40% threshold the Project:One uses a heavily reworked variant of the PU106 to suit its new environment, as it uses all of the ingredients that have made the W05-W08 so special and remixed them to provide a mouth watering experience. The direct injection, 1.6 litre V6 internal combustion unit is complimented by a single turbocharger coupled to which we find a motor generator unit - MGU-H. 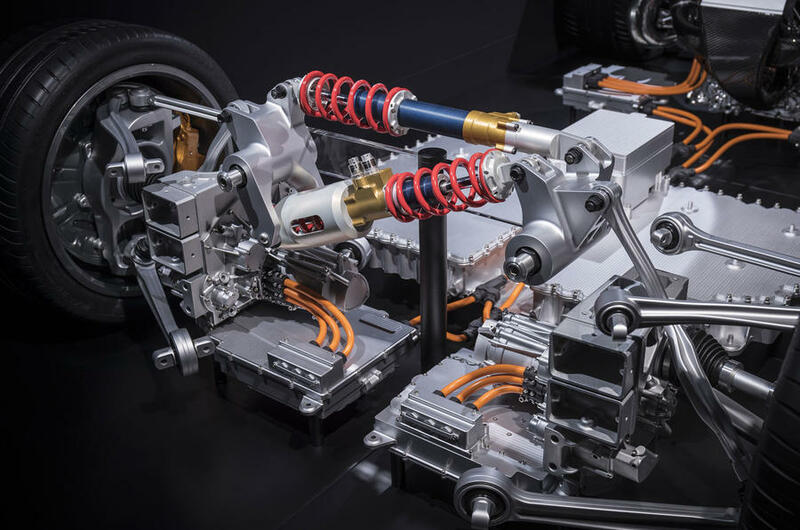 Attached to the crankshaft and responsible for beefing up performance by up to 120kw is the MGU-K found installed as part of the F1 unit but added to the mix are a pair of hub motors that are capable of delivering 120kw to each of the front wheels. Again, without the FIA’s regulatory framework to consider the energy store has been broken up into several components, giving the Project: One four times the storage capacity of its F1 brethren delivered through an 800v system, rather than a 400v one. 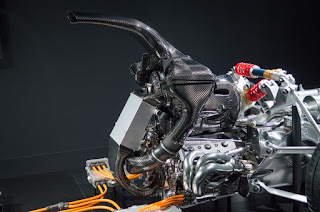 The introduction of new regulations for 2014 forced Formula One’s engine manufacturers to not only consider the design of the powerunit but also how it impacted on the how their packaging choices impacted the team's they’d supply. The reintroduction of the turbocharger, a single, centreline mounted one at that likely led to much head scratching as they defined their designs. Tantamount to those decisions was the installation of a motor generator in sequence with the turbocharger that can both harvest and deploy energy, depending on the prevailing conditions. 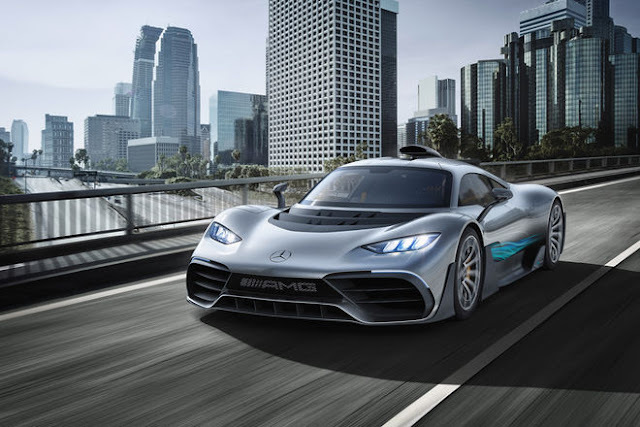 Mercedes took the more complicated but holistically better packaging option of splitting the turbocharger and placing the turbine at the rear and compressor at the front of the engine's Vee. Between the two we find the MGU-H, slowing the turbo to harvest energy and assisting it to keep it spooled up. The turbine and compressor are pancake shaped, in order that they’re housed in the face of each end of the block, giving them the desired shape to produce the requisite boost but outwardly giving the impression that the turbo is bigger than it actually is. Like its forefathers the Project:One uses a liquid-air chargecooler mounted in front of the engine, giving the shortest possible boost tract to the inlet plenums that enclose the variable length trumpets that respond to the given throttle demand. Bolted to the side of the engine block you’ll find an MGU-K which is mated to the engine's crankshaft through a reduction gearset and able to deliver up to 120kw to help propel the car forwards over the course of entire lap. This is an example of the development posed by the new for 2014 regulations, as previously KERS had only supplemented their FO range of V8’s with 60kw as more of a push-to-pass system for roughly 6 seconds. The MGU-H and MGU-K work together as part of a complex energy scheme, which is regulated to an extent by the amount of energy that can be stored per lap. 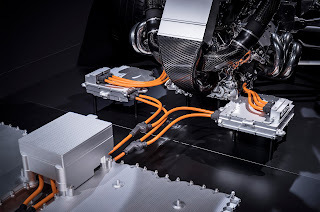 However, one of the key ingredients and which has been pivotal to Mercedes success is the way in which energy can be shared between these motor generators without the need to store it. The energy scheme permits the MGU-H to deliver energy via the control electronics to the MGU-K, missing out the AC/DC conversion needed for storage in the complex array of lithium-ion battery cells and visa versa. This means that at any time numerous energy flows can be occurring, such as the MGU-H recovering energy and sending it both to the energy store for later use and directly to the MGU-K for instant use. Or the MGU-K recovering energy under braking and sending it to the MGU-H to keep the turbo spooled, whilst sending any residual energy captured to the Energy Store. Of course in the case of the Project:One there are now two additional MGU-K’s at the front of the car, able to harness energy under braking or deliver up to 120kw each. This really changes the car's energy throughput and further complicates how energy moves between each of the motors. 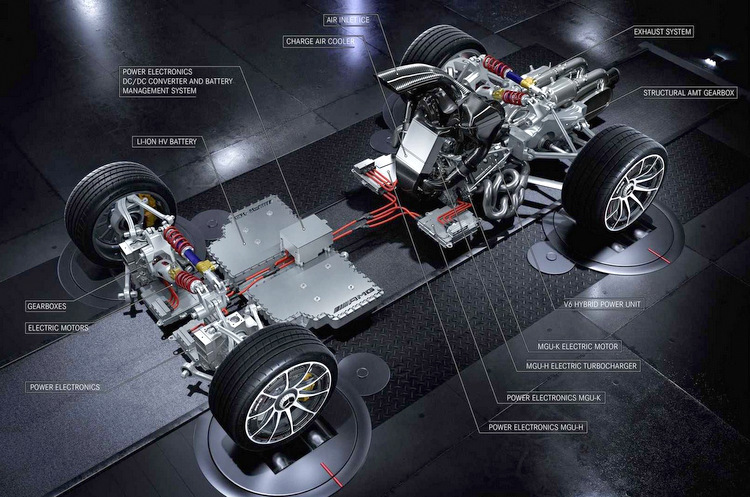 However, what it does mean is that when the driver stamps on the brake or loud pedals the car reacts accordingly, with torque vectoring giving the driver a huge performance boost from the front axle through the corners. It must be said that whilst the use of these four electric motors is a fascinating prospect, one I’d love to see first hand - even on a dyno, the internal combustion engine still plays a pivotal role in delivering the circa 1000bhp that the car is putting out. The inclusion of the Petronas livery/branding on the car also plays into the story of how the lubricant giant has partnered with HPP and Mercedes to deliver huge thermal efficiency gains and helped to drive forward a lean-burn combustion revolution. For those unaware of the regulatory side of Formula One the teams are restricted to a maximum of 105kg of fuel to cover a race distance (100kg at the start of the regulation set in 2014) of which a fuel flow restriction of 100kg/hr must also be maintained. 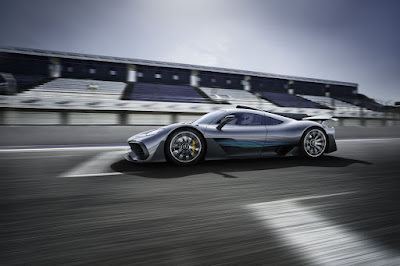 This led to an arms race at the beginning of the hybrid era of which Mercedes and Petronas were already ahead of the curve, with their own turbulent jet ignition technology and fuel blends helping them to circumvent the burn rate issue created by limitations in the regulations. Having nailed these issues it’s of no surprise that they are able to extract a four figure sum from a toned down version of the F1 powerunit in their road car but whilst the F1 engine revs out to around 13,5000rpm at absolute full-chat the Project:One is restricted to a more sedentary 11,000rpm. Now that’s not because they’re scared of what joe public will do with more power in their hands it’s about the resources available to them, afterall it will need to be run on pump fuel - 98 or even 95 Octane. So, for those questioning the claims that Formula One powerunits are running close to the 1000bhp holy grail and wondering why a car with an extra 320bhp from the front wheels is only claiming the same, this is the key and shows just how much more can be gained. 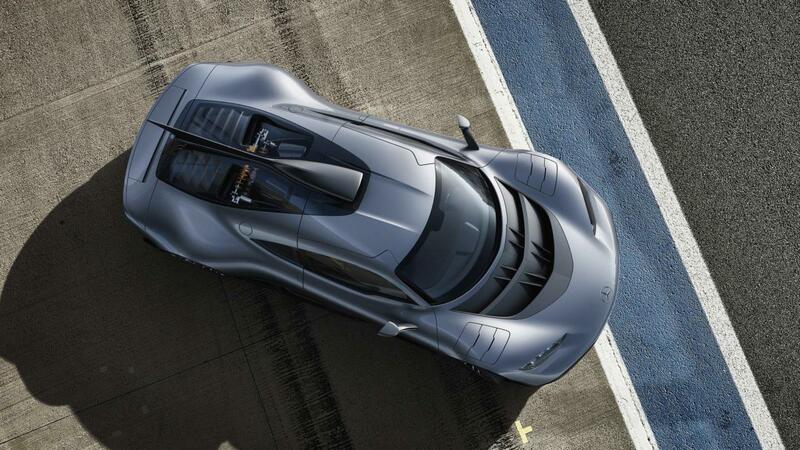 Like their four F1 challengers since the start of the hybrid era the Project:One utilises an 8-speed gearbox. However, this is not a direct transfer from the design desks of Formula One, rather a bespoke unit better suited to the rigors of life on the road. The Project:One is going to be a ballistic missile out on track but the efficiency garnered through the various powerunit elements should make it relatively frugal whilst out and about on the road. However, should the owner find the need, or indeed themselves in a spot of mechanical bother the ERS can run in electric mode, via the front hub motors, around 15 miles before fully depleting its energy stores. Mention the word hypercar and everyone immediately think of the bonkers machines built by the more niche car makers and in fairness when you consider the hype that has surrounded Project:One, given its use of an F1 powerunit, you might be a little disappointed. However, much like the world of F1 you have to really get under its skin to appreciate the finer details of what will be an awe-inspiring thrill ride. Only 275 of these cars being built and reportedly all of them have already been sold (even with a €2.3 million price tag) which means that it’s unlikely that someone like myself will ever get to sample the car's credentials but if they do I’ll all but guarantee it’ll be a once in a lifetime experience.